Recently, Beth suggested a couple movies that I should watch for research purposes. Say no more, I was happy to get the chance to finally sit down and watch a movie in its entirety and it was all in the name of research. From the opening scene to the rolling credits, I was enraptured. I fell in love with this movie, the cast and the small town in which it was filmed. Of course, it always helps to see Johnny Depp on the screen. From Wikipedia: Chocolat tells the story of a young mother, played by Juliette Binoche, who arrives at the fictional, repressed French village of Lansquenet-sous-Tannes with her six-year-old daughter and opens La Chocolaterie Maya, a small chocolaterie. Her chocolate quickly begins to change the lives of the townspeople. I had a great time joking with Tori this week about our Procrastination Kingdom Ifandwhendia. I am the queen and she is the princess and it got me thinking about...royalty. Specifically the term "princess" stuck in my head. And then I had the delightful remembrance of a movie I have seen several times and still love. This movie has everything... it's a love story, a comedy, and it has adventure! Great for everyone, young and old! From IMDb: A classic fairy tale, with swordplay, giants, an evil prince, a beautiful princess, and yes, some kissing (as read by a kindly grandfather). Even though I don’t get to see as many movies as I’d like to, I very much enjoy discussing the ones I have seen. The good and the bad. Those who know me well know my taste in movies. My young friend and co-worker at the library, Taylor, knows my reading and viewing taste pretty well. He was stunned to learn I’d never seen a certain period film that had been nominated for seven Oscars, including Best Picture. He made it his mission to nag, er, gently nudge me into watching it. He even loaned me his personal, treasured copy. He insisted that I would love this movie. That this was my kind of story. After several weeks, I finally carved out some time. At 7am on a stormy Sunday morning. He’s right. 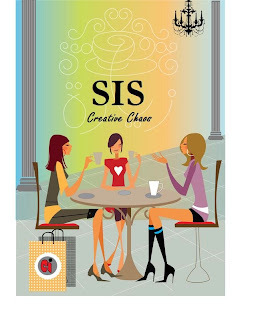 I loved it… even though it wasn't exactly what I'd call my kind of story. 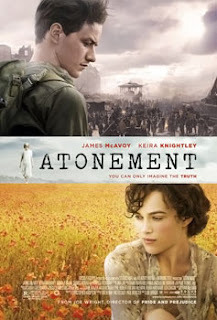 Adapted from Ian McEwan’s novel of the same name, Atonement is a mystery/drama/love story set in England during WW II. The performances by stars, Keira Knightley, James McAvoy, and Saoirse Ronan are haunting and spectacular. The cinamatography and film score are stunning. And the story . . . powerful and heart wrenching. It’s best to go in as I did… knowing nothing. Just watch, wonder, and weep. I've seen Chocolat and enjoyed it. It's been several years ago,though, so I should watch it again to refresh my memory. Atonement is a great film. That's why it was one of my very first movie recommendations here at SIS. I'm glad you finally got to watch it. I have never seen THE PRINCESS BRIDE. What is wrong with me? I feel completely movie deprived. I have seen ATONEMENT and it was wonderful. I've seen two out of three -- "Atonement" is on my "WannaSee" list. Barb, get WITH IT!! "Princess Bride" is CLASSIC, and right up your alley! Also, "Chocolat," I enjoyed that one if for no other reason than you really never get what KIND of movie it is (that old "genre" thing again!) until the end. My pick for this week: "Changeling," with Angelina Jolie. Very well acted by all, another Clint Eastwood directing triumph, disturbing as hell because it is a true story that feeds nicely on my one true real fear in life -- being committed when I KNOW I'm not crazy! There is just NO way out of that situation without the requisite cinematic Hero "busting you out," as happens in this movie. I know, I know. I do need to get with it. I want to see CHANGELING. I've heard great things about it. Can I assume you're being facetious with your Tarentino comment? I love, love, LOVE Chocolat! It was magical and so well acted. And, well, yeas, Johhny Depp was a visual bonus! Princess Bride... CLASSIC! As Richard said. I own it. I've seen it multiple times. So clever and sweet! Don't you just love Billy Crystal and Carol Kane's characters? Richard, I've heard nothing but great things about CHANGELING. Although, I have heard it's heartwrenching. Barb, be warned. I heard it's especially tough for 'moms' to watch. Also, Richard... so envious that you're going to see Inglorious Bataserds!! The reviews have been awesome. Taylor's going to see it tonight. Maybe you two guys can give us the lowdown. Of all these, I've only seen The Princess Bride. "My name is Inigo Montoya. You killed my father. Prepare to die." "Nonsense. You're only saying that because no one ever has." No, I've only seen a time or thirty... LOL! One of my FAVE lines. And does that sword fight rock, or what? Barb, I love Chocalat. Johnny Depp is great. I liked him best in Fear and Loathing in Las Vegas. Brenda, Princess Bride is a wonderful movie. I watch everytime it is on T.V. Beth, I haven't seen Atonement yet. I is on HBO On Demand so I will watch it soon. Richard, I am the Tarrintino fan. I don't get to the movies very often so please let me know how Ingloriuos Basterds is. I will probably have to wait until it comes out on DVD. Nope, Barb --- wasn't a facetious jab --- just onset of Alzhiemer's;)! And, I will GLADLY post a "review" of Tarantino's latest, being a HUGE fan of his DIRECTORIAL efforts, yet "honest" (read: LOVE "Pulp Fiction," LOVE "Kill Bill, 1 AND 2," etc. and so on .. but NOT so thrilled about a few of his NON-Directorial efforts) ... but, still ... CAN'T WAIT!!! And now that I am CLEAR (for the moment) --- I'm doing it for YOU, B.J.!!! ;) Oh, and just so you know --- same as you, B.J., funds-wise -- if I hadn't been unexpectedly paid DOUBLE for last night's gig, I'd be waiting for a (PIRATE!) DVD, too, otherwise sitting at home surfing cable TV on a Sunday;)! Our local blockbuster is going out of business. Last night I scarfed up two cheap dvds of two fave moveis--PRACTICAL MAGIC and, a litle known, but funa dn sweet film--SOMEONE LIKE YOU. So excited! Hi Beth, I love Practical Magic. It is one of my favorite wicthy movies. Not sure if I know Someone Like You. I will have to look it up. Barb - I think nowadays Chocolat would be a film I would love to death. It shall be added to my 'must-see' list!! Bren - Beth harps on me so much for never seeing 'The Princess Bride' so I think I owe it to her to see it soon. Maybe by next Saturday I'll be able to recommend it! Beth - Don't make me blush with your pick! I'm only trying to help save the world with one good movie recommendation at a time! And let me just say that Inglourious Basterds is a fine film, and Roger Ebert's review is the perfect summery of its excellence. His best line? "Like a lot of real movies, you relish it more the next time." I look forward to the next screening I can get my hands on!! Sorry, Kids --- plans got changed and my movie-going cohorts changed their minds --- no Tarantino (and, no spoilers, either, though)! :( But, we DID go see "District 9" -- GREAT movie! Very well done, written, acted and executed. In fact, it could be worthwhile even if you don't like "creature features;" still a well-crafted drama.